As foreshadowed in my post announcing my part-time back-to-school-status, my painting class (and the marvelous Ms. Clements) at Laguna Gloria has offered a wealth of writing and visual material. 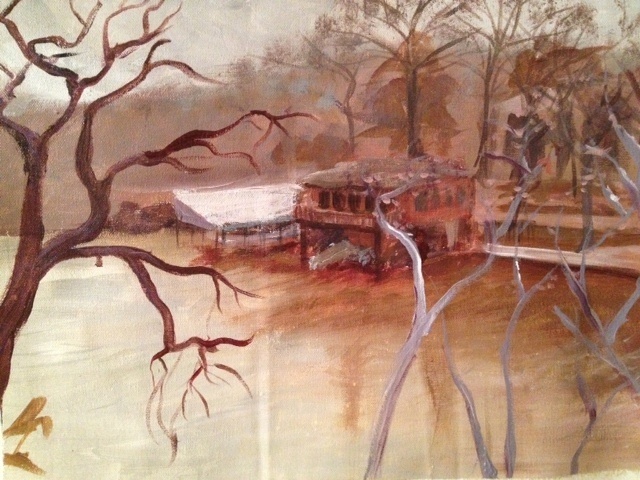 My favorite experience in the past month has come from our study of En Plein Air painting. I’ve dabbled in landscapes, but only of the photographic variety. Being out in the wide-open, enjoying an Austin winter, is a stupendously delightful experience, but it is not without some frustration. Space and light take you on quite a ride as you try to convert them from their 3-dimensional environment to your very flat canvas. Even more, the constant but imperceptible change that is constantly happening as the sun makes it’s way across the sky keeps you asking and mending your previous brushstrokes. All this as part of the deal, painting what you see and feel outside connects you with your surroundings in a way that no photograph ever could. 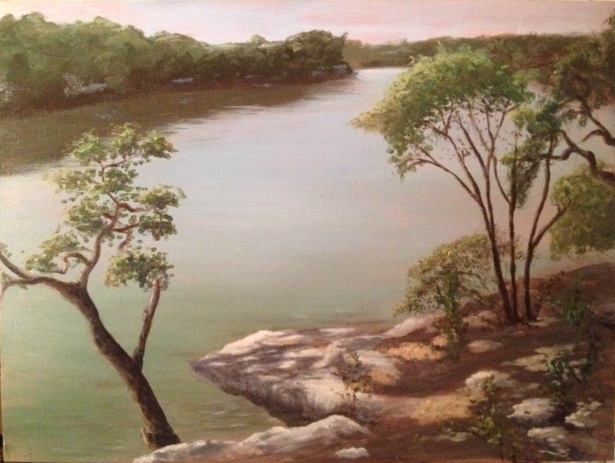 Sunny, gray, wintry, hot…I’m thinking I’ll be painting the outdoors [outdoors] much more now! My plein air studies also clearly demonstrate how the more you try it, the better (and easier) it gets! Always a welcome feeling. I still have a looong way to go before I’m effortlessly creating masterpieces from the comfort of my outdoor easel, but from my first study to my last, it only got better (nevermind that was the only direction it had to go…). PS: On the two studies I left off the leaves, but don’t be fooled: It’s not really winter here. Pam, thank you SO MUCH! I will certainly let you know when/if that happens :). Good to hear from you! These are great, red! I find the most frustrating thing about plein air is the changing of the light and the fact that you have to keep coming back to the same place day after day at the same time! Unless you are fast enough to get it all down in about an hour and a half–which I’m definitely not! Thank you! I totally agree. I can’t imagine doing this in oils and waiting for the layers to dry in addition to fighting the sun! Maybe a challenge for the future… It is amazing (and frustrating) how much the colors change depending on where the sun is. I love your paintings. Every time I look at one–whether it is a landscape from a dock or a can of Tecate in the sun–I just feel so relaxed and at ease. Great to see and “hear” you work through your process, too! This is one of the nicest things I’ve ever heard about my art. Thank you, Larissa! I hope to keep the relaxation coming–those colorful umbrellas are calling my name today. Love to you guys in Iceland! 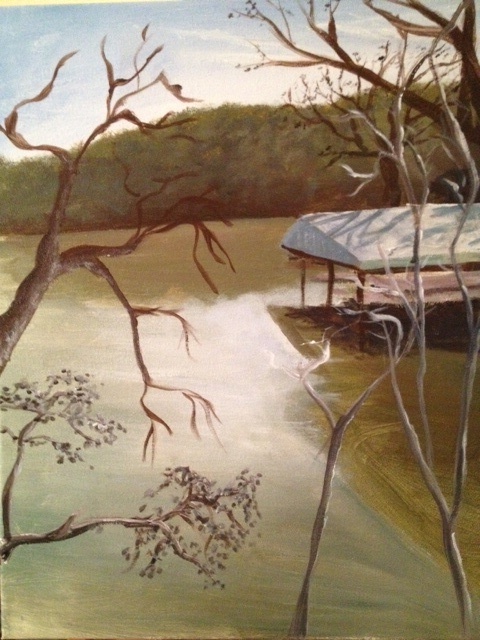 Your paintings capture the feel of the river, its movement and hues. I hope this summer gifts you with time to observe and paint. We shared a great painting class together. I hope to keep in touch. Thank you for the lovely comment. I hope the summer is filled with lots of painting and the same explorative mentality that your class helped me find! Let’s definitely stay in touch–I’m looking forward to seeing what your “retirement” allows you to produce!